In July 2013, a general strike and mass demonstrations erupted in Tunisia after Mohamed Brahmi, an opposition leader to the democratically elected Islamist Ennahda party, was assassinated. Under public pressure, and with the facilitation of the national labor union, the Ennahda party eventually agreed to step down from power to allow the successful completion of a moderate constitution. Many analysts argue that the reason Tunisia fulfilled a democratic transition is that their Islamist Ennahda party is more moderate and inclined toward civilian political order than its Islamist counterparts in other countries, such as Egypt. Ennahda’s willingness to engage in constructive dialogue with secularists in writing a constitution is viewed as the main factor behind the democratic transition. However, this popular approach underemphasizes the main driving forces behind the Tunisian revolution, which are the underlying economic inequalities and structure of the country’s patronage system. Economic inequalities and public sector corruption have blurred the Islamist-secularist divide, and are the main factors behind the Tunisian revolution and the potential consolidation of its democracy. Demonstrations on January 14, 2011 against President of Tunisia Zine al-Abidine Ben Ali. More photos of the Tunisian Revolution at totallycoolpix.com. Despite popular depictions of a clear and sharp Islamist-secularist divide in Tunisia, Islamists and secularists have some overlapping identities and shared common-interests across history through their membership in unions. The Tunisian General Union of Labour (UGTT) traces back to 1946, when it fought alongside Habib Bourguiba to achieve Tunisian independence from France in 1956. However, in 1978 President Bourguiba’s neoliberal policies and the rising cost of living led to strikes and the state’s crackdown on union activists (Toensing). During that period, increasing numbers of Islamists from the banned Ennahda party were also members of the UGTT. The shared history and struggle against Bourguiba’s oppressive Neo Destour party created a common identity between unionists and Islamists that continues to this day. In 2011, at least 70 out of 500 UGTT official delegates were affiliated with Ennahda (Wolf, and Lefevre). Additionally, there were many more Islamists that were part of the approximately 500,000 workers represented by the UGTT in Tunisia (Noueihed and Warren 69). These affinities and shared struggles illustrate the blurring of the so-called Islamist-secularist divide. During the 2011 Tunisian revolution, many Islamists were part of local unions and protests further blurring the Islamist-secularist divide. While unable to organize as an Islamist party, many Islamists protested against the Ben Ali regime through local unions and professional syndicates that were integral to the revolution (Noueihed and Warren 69). After all, Islamists are not just Islamists but also miners, doctors, teachers, lawyers and journalists. The economic struggles that Islamists experienced alongside their nonreligious counterparts as well as shared historical affinities suggest that the Islamist-secularist framework is oversimplified and cannot be used alone in assessing Tunisia’s transition to democracy. Local labor unions consisting of activists across the Islamist-secularist divide represented the common struggle against public corruption and inequality that eventually led to the Tunisian revolution. In 2008, the Gafsa mining region experienced a wave of protests and strikes against the allocation of jobs in the mining industry and in the state-owned Gafsa Phosphate Company. Local unions and individuals from diverse party-affiliations staged sit-ins that spread throughout the southwest, an inland region known to experience higher unemployment than the coastal region (Noueihed and Warren 69). Two years later, socioeconomic riots occurred in the southern province of Ben Gardane. And in December 2010, a 26 year-old man named Mohamed Bouazizi committed self-immolation after his fruit-cart was confiscated in Sidi Bouzid, an inland city suffering from high unemployment and a large informal economy. Local labor unions in mining regions reflecting the large regional inequalities were the precursor to the revolution. Economic inequality alone cannot lead to the toppling of regimes, but requires the addition of decisive coup-supporting coalitions. Analyzing the history of regime changes along with their corresponding levels of inequality, Nancy Bermeo concludes that while inequality alone may be dangerous to regimes, it is insufficient for regime chance. For democratic regime collapse to be possible, economic inequality must be complemented by a coup-supporting coalition that has both the will and ability to topple a regime (Bermeo 30). While Bermeo analyzes the collapse of democratic regimes, her conclusion that there needs to exist a coup-supporting coalition is also relevant for the collapse of Ben Ali’s authoritarian regime. A coup-supporting coalition made up of the UGTT, local labor unions and the military complemented economic inequality as a major factor leading to the collapse of Ben Ali’s regime. The national UGTT union was opposed to the Bourguiba regime, but was largely coopted under Ben Ali’s rule (Noueihed and Warren 69). As mentioned, the start of the revolution was a decentralized phenomena led by local unions and activists. However, when the national UGTT leadership realized that Ben Ali is not likely to stay in power for long, they turned their active support toward their local unions (77). This change in strategy by the national UGTT leadership, along with the military’s refusal to support Ben Ali, created a coalition of local activists and unions together with the powerful military and UGTT, which convinced Ben Ali to flee the country. Hence, inequality coupled with a UGTT-military-local union coalition fulfilled Bermeo’s necessary conditions for a successful revolution. 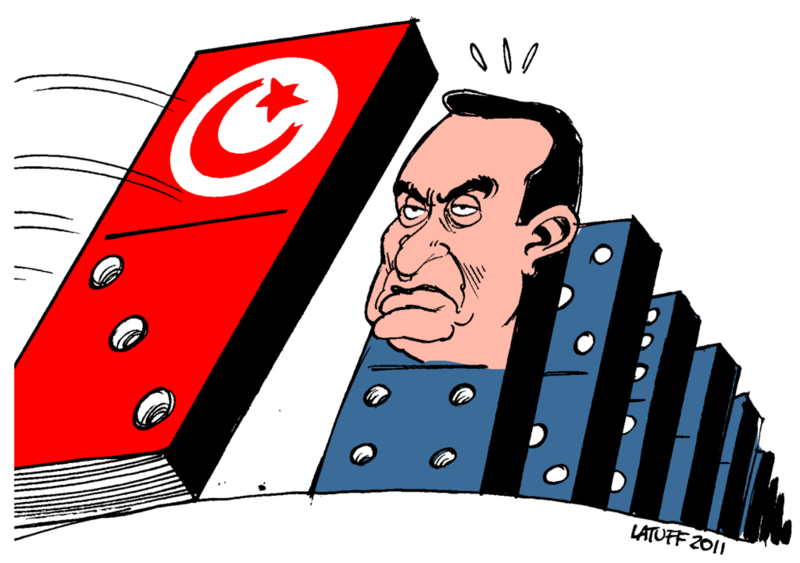 Tunisia sets off a domino effect through the Arab World, the so-called "Arab Spring." Prior to the revolution, the so-called Economic Miracle of Tunisia looked good to the outside observer, but inequality and discontent were rising rapidly for many years. In the decade prior to the Tunisian revolution, the country boasted an average of 5 percent GDP growth, a largely industrialized economy and a dominant service sector. However, behind these figures, unemployment was never below 14 percent from 1981 to 2014 (Achy 8). Export-oriented industries and private investments generating high-skilled jobs were concentrated mostly in the coastal regions thereby increasing regional inequality. From 2005 to 2009, inequality, as measured by the Gini coefficient, increased from 38 to 41 where 100 represents all resources held by one person or total inequality (Achy 17). While the Tunisian economy was largely industrialized and constantly growing, regional inequalities and discontent were rising. The structure of the Tunisian economy presented a fertile ground for rising inequalities and high unemployment. As Nobel laureate Michal Spence explains, the phenomenon of rising inequality occurs when employment growth is present mostly in the nontradable part of the economy that is characterized by low-skilled and low-wage jobs (Spence 32). The nontradable tourism industry is a large source of employment in Tunisia, but provides mostly low-skilled jobs. In 2010, only eight percent of jobs created in the large nontradable Tunisian tourism industry were designed for postsecondary-educated employees. In contrast, higher education enrollment increased from 23 to 35 percent between 2002 and 2011 (“UIS Statistics”; Achy 10). Hence, a major part of the Tunisian economy does not create high-skilled jobs, while the population is becoming increasingly educated and high-skilled. In contrast, the tradable part of the economy offers high-skilled jobs but limits these to the coastal region causing huge regional inequities. In December 2010, 1,963 foreign firms employed nearly 185,500 people in the coastal provinces of Monastir, Sfax, Mahdia, Sousse and greater Tunis. In contrast, only 91 foreign firms employed 11,220 people in the southern and interior provinces of Gafsa, Kebili, Tozeur, Kairouan, Kasserine and Sidi Bouzid, where the 2011 revolution started (Noueihed and Warren 90). While the largely nontradable tourism sector employed large amounts of low-wage labor, the mostly tradable sector of foreign firms limited its high-wage employment mostly to the coastal regions further increasing regional inequalities and discontent. A decrease in public sector jobs and slow private sector growth resulted in the creation of mostly low-skilled jobs and higher unemployment. The decrease in relatively prestigious public sector employment opportunities was not matched by an increase in private sector employment for the young unemployed. In the three years leading to the Tunisian revolution, the government sector offered half the amount of jobs it did during the 1998 to 2006 period (Achy 9). In addition, 97 percent of all firms were small and unsophisticated each providing less than five low-skilled jobs on average (Achy 10). In response, university graduates were unemployed for an average of two years and four months before finding a job. Hence, the trend of declining prestigious public sector employment along with slow private sector growth resulted in higher youth unemployment. Lax oversight and a hesitant banking industry prevented firms from growing and generating high-skilled employment. Red tape and difficulty in receiving loans from a banking industry that is largely dependent on personal relationships depresses the growth of business. A high 19 percent rate of nonperforming loans is due in large part to lax oversight of banks and the unwillingness of regime-connected elites tied to pay back loans ("Viewing cable 08TUNIS679”). According to a 2009 diplomatic cable, Ben Ali’s son-in-law purchased a controlling stake in a bank later selling his stake to a foreign bank that included a large off-the-books premium. As a result of corruption and a hesitant banking industry, private investments constituted only 60 percent of total investments compared to Egypt’s 75 percent and Morocco’s close to 80 percent (Achy 10). Banking corruption and low private investments directly leads to slow company growth and higher youth unemployment. While the Tunisian economy is industrialized, manufacturing jobs are concentrated in the coastal regions further breeding regional inequalities. Tunisia’s dominant manufacturing industry represents 72 percent of all exports (“Tunisia”). Textiles, automotive parts, aeronautics are dominantly traded with the EU, yet the export-oriented industries are predominantly located in the coastal regions. Over the past twenty years, for every ten jobs created in the industrial sector, nine of them were located along the eastern coast, while only one was created in the rest of the country (Yasmine). The inland region’s only main exportable industry is phosphate, yet the price of phosphate has decreased in the past decade and appointments to management positions in the mining industry remain political. Hence, manufacturing industries that generate high-skilled jobs are located predominantly in the coastal regions further aggravating regional inequalities. Achy, Lachen. "Tunisia's Economic Challenges." Carnegie Endowment for International Peace. December 2011 (2011): 1-28. Web. 16 Mar. 2014. .
Bermeo, Nancy G. "Does Electoral Democracy Boost Economic Equality?" Journal of Democracy. 20.4 (2009): 21-35. Print. Diamond, Larry . "Why Democracies Survive." Journal of Democracy . 22.1 (2011): 17- 30. Print. Joseph, Richard. "Is Good Governance Necessary For Economic Progress in Africa?." AfricaPlus (2013): n.pag. Web. 11 Feb 2014. Noueihed, Lin, and Alex Warren. The battle for the Arab Spring: revolution, counterrevolution and the making of a new era. New Haven: Yale University Press, 2013. 1-348. Print. "Rock Phosphate Monthly Price - US Dollars per Metric Ton." Index Mundi. N.p., n.d. Web. 16 Mar 2014. .
Saleh, Heba. "Strikes and political divisions plague Tunisia phosphate industry." Financial Times. 19 02 2014: n. page. Print. Spence, M. "The Impact of Globalization on Income and Employment." Foreign Affairs New York. 90.4 (2011): 28-41. Print. "The First English Translation of the Tunisian Constitution by Jasmine Foundation." The Jasmine Foundation for Research and Communication. The Jasmine Foundation, 25 01 2014. Web. 16 Mar 2014. .
Toensing, Chris. 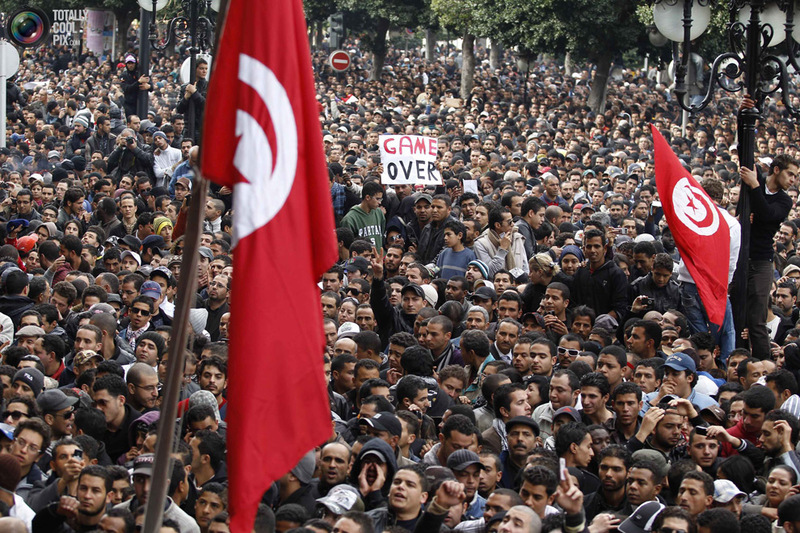 "Tunisian Labor Leaders Reflect Upon Revolt ." Middle East Report. 41.Spring (2011): n. page. Web. 16 Mar. 2014. .
"Transparency International: Civil society key to anti-corruption success in Middle East and North Africa." Transparency International. Transparency International Secretariat, 03 06 2013. Web. 16 Mar 2014. .
"Tunisian annual inflation rises to 6 percent in December." Reuters. 06 01 2014: n. page. Web. 16 Mar. 2014. .
"Tunisia Country Profile." Business Anti-Corruption Portal . GAN Integrity Solutions . Web. 16 Mar 2014. "Tunisia declares Ansar al-Sharia a terrorist group." BBC News. 27 08 2013: n. page. Web. 16 Mar. 2014. .
"Tunisia Economic Outlook." African Development Bank Group. N.p.. Web. 16 Mar 2014. . "Tunisia." World Trade Organization. N.p., n.d. Web. 16 Mar 2014. .
"UIS STATISTICS IN BRIEF ." UNESCO Institute for Statistics. United Nations, n.d. Web. 16 Mar 2014. .
United States. CIA. World Factbook. Print..
"Viewing cable 08TUNIS679, CORRUPTION IN TUNISIA: WHAT'S YOURS IS MINE." Wikileaks. Wikileaks, 23 06 2008. Web. 16 Mar 2014. .
Wolf, Anne, and Raphaël Lefevre. "Tunisia: the Islamic politics of trade unionism ." openDemocracy . N.p., 21 05 2012. Web. 16 Mar 2014. .
Yasmine, Ryan. "Tunisian revolution yet to solve inequality ." Al Jazeera. 11 04 2011: n. page. Web. 16 Mar. 2014. .
Dor Srebernik graduated in 2014 with a Bachelors degree in Economics and Political Science from Northwestern University in Evanston, IL.